Food is a large part of everyone’s budgets and if we could just cut down our grocery budget, that would leave more money for other things. You search all over Google for tips on how to save money on groceries and you’ve read over and over that buying food on sale, couponing, and meal planning are a huge part of it. But how do you really do it? Like really do it without getting a panic attack? I dug a little further and asked how she did it. Sarah used up what was in her pantry. Then she took advantage of meat sales that her husband has access to through his work once a week. Next, Sarah shopped at Dollar Tree for little things and Walmart for the rest. She put everything together in menu plan for the week for groceries. And having a menu plan was extremely useful in helping her stick to her list and grocery budget. How can you meal plan using grocery sales? 1. Use up what you have. It sounds simple but it’s easy to skip this step, especially when you’re in a rush to get out the door. Check what you have in your fridge and pantry first, when menu planning. Use up whatever leftovers you have, meat, or produce that’s going to go bad soon. Is there one thing you need to buy to make a meal, using what you already have on hand? 2. Focus on sales of meat. Meat and protein are the most expensive thing at the grocery store. Where can you get it cheaper? Which stores have the best sales and has the freshest product? Costco has the lowest price for organic chicken but I don’t buy it from there. In my past experience, their organic chicken smelled off and was not the freshest. I bought it several times to see if it was a fluke but it wasn’t. Each time I tore off the package and smelled the meat, it had this pungent, ammonia like odor. Fresh meat isn’t supposed to smell like anything just like fresh seafood. The meat was still “fresh” and well over a week before it’s expiration date. Then I would cook this old smelling chicken in the oven, hoping that it would taste fine when it was cooked, but it didn’t. It tasted awful and I couldn’t bring myself to eat it. I don’t know about you but I don’t enjoy eating old chicken. I don’t care how cheap it is! I’m not the type who buys chicken on the day that it expires because my family and I can taste the difference. Plus, we don’t like to chance food poisoning. There’s nothing wrong if you do and if it doesn’t bother you. Do what works for you. If your family doesn’t care, then go for it. I go to Trader Joe’s for chicken instead because they get daily deliveries of organic chicken. I will willingly spend 49 cents more per pound for fresher chicken because I know it will taste good after I cook it. Also, their prices are lower than local grocery stores. 3. Buy in season produce or glean from someone else’s garden. Refer to my monthly guide to grocery sales to see what’s in season. Produce in season will vary by region. Plan meals around what’s in season. You might discover new favorites by trying vegetables other than the old standby’s of broccoli, carrots, celery, spinach, and corn. I’m lucky that my dad gardens. So I get bunch of whatever is from his garden every few weeks. And I integrate that into my meal planning, which may mean cooking mustard greens two ways, into a soup and stir fry, to use it up. Do you know anyone who tends a garden? They usually harvest a stockpile of whatever they’re growing and cannot eat it all. Be a good friend or neighbor and “help” them take it off their hands, with their permission of course! 4. Stock up on pantry staples that are on sale. 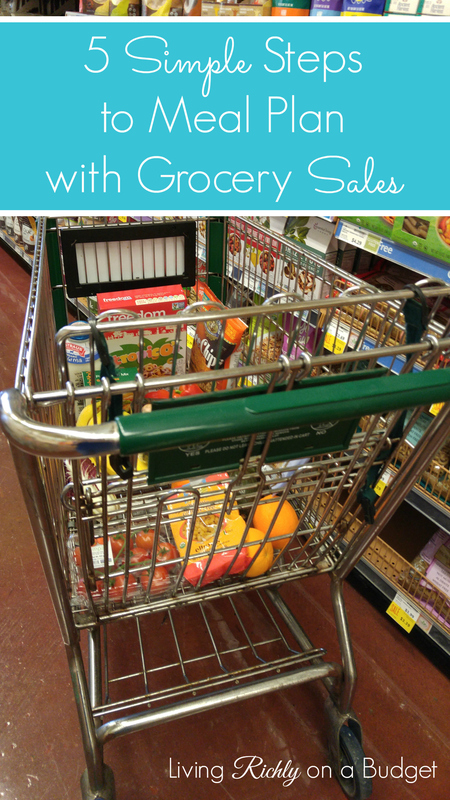 Use my monthly guide to grocery sales to see what sales are coming up. And use this to plan your shopping trip. Just two days ago, I found two coupons for my favorite gluten-free bread, Canyon Bakehouse. OMG, it’s the best tasting bread ever! Tastes like fresh, baked bread! It’s so good that my daughter refuses to eat any other bread and she will eat the entire crust too! I snagged this bread, which is usually $5.79 at Target, for just $3.63 each! That’s almost 40% off! I bought two breads but I should really stock up on more when I get around to printing coupons from another computer. You can only print two copies of the same coupon per computer. I also scored three cartons of Tazo chai concentrate, my favorite go-to chai, for free and made 13 cents from it! Whaaaat??? The chai was on sale for $2.79 and I had a $2.00 off coupon and a $1.50 off coupon. Then Starbucks will give you a $5.00 Starbucks gift card when you buy three Tazo chai’s. 5. Create a menu plan around what you have and what’s on sale. Menu planning takes time and planning. But if your goal is to save money, then set aside some time to do this because it will be worth it. Plan your meals for the week, based on your schedule. Are you going out to dinner to celebrate grandma’s birthday on Wednesday? Then make a note of it on your menu planner. That’s one night you don’t have to cook! What recipes can you make using what you have and what’s on sale? Don’t try out too many new recipes at once or you might get overwhelmed. And don’t try out a new recipe on a busy weeknight, where you know for sure that you don’t have a lot of time to experiment. What are your menu planning tips? Read Meal Planning 101 for a step-by-step guide. Thanks for the commet, Sandie!